Taste: Pai Mu Tan is good prelude on way to taste white teas. It has good deal of tenderness and sweetness, but due to part of natural fermentation, has more strenght and vitality than Yin Zhen. Brewing instruction: For this tea we can offer you two distinctive metodes of brewing. Extetnded one – called Gong Fu Cha and short one – chinese common metod. Important points to brew Pai Mu Tan using Gong Fu Cha way of preparing tea. 1. Weight of tea – 7 g or six teaspoons on tea pot capacity 150ml. -	first brew – 10 sec. Not drinkable, prewashing leaves only. -	second brew – 20 sec. -	third brew – 30 sec. -	forth brew – 40 sec. -	fifth brew – 1 min. Chinese common brewing metode: Take about 4 - 5g tea on about 250ml glass or pot. Boil fresh water and pour over the tea. Wait about 2 - 3min till buds settles down then sip your tea slowly. After finishing cup more hot water shall be add to make second and third brew. You can make many more brews out, but our experiance says, that following brews should be allowed to infused more time as temperature of water falling down and much of tea contend has extracted in the previous brews. 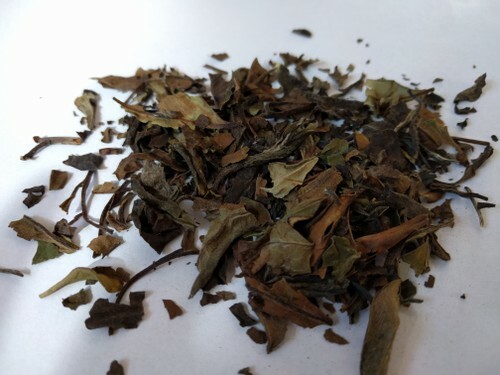 Product highligths: Pai Mu Tan often translated as „white peony” is very attactive white tea. Ussually, teas has been plucked from same wild tea bush as Yin Zhen. Distictive, little „messy” apperance gives impresion that this tea has gone throught very natural way of proceeding. Really, after plucking tea has been only whithered and later dried. Similary, like prestige Yin Zhen, also for Pai Mu Tan any mechanic rolling or shaping process has to be avoided. One can enjoy to observe tea leaves in they most genuine shape.